Home Dehumidifiers - How Do You Choose? Home Dehumidifiers start appearing on shopping lists in the USA at the end of April, as the weather warms and humidity rises. For many folks picking the best dehumidifier is not easy and although there is plenty of sales copy to read information is in short supply. In this article I will suggest a few simple guidelines for making the best choice of dehumidifier and provide you with links to take you to more detailed information, including our reviews of individual models, whenever you feel it would be helpful. We have tried to provide all the information you need about dehumidifiers for home use but, if there is something we haven't covered, please feel free to ask a question. Your question and the answer will be published here. If you provide an email address, we will let you know when it's ready and where you can find it. If you have a problem with excessive humidity throughout your home you may be thinking about installing air conditioning. Air con will certainly reduce the humidity level in your home but don't go for "over-kill", a system that is much more powerful than is needed for the size of home you live in. Air con is designed to control temperature and is governed by a thermostat. When the programmed temperature is reached the thermostat switches off the system. Humidity control is a useful by-product but, if your air con is over sized the programmed temperature will be reached very quickly, before the system has had enough time to reduce relative humidity to a comfortable and safe level. If you already have air conditioning yet still have a humidity problem, or if you are planning to install air con and want an over sized system to reduce temperature more quickly, you may wish to consider a whole house dehumidifier. A whole house dehumidifier is a powerful but compact unit that is usually installed alongside your heating system and is integrated with your HVAC ducting. It is controlled separately from your air conditioning by a humidistat so that even when your air con has cycled off the dehumidifier will continue to operate until relative humidity is reduced to your preferred level. Whole house dehumidifiers are built to commercial standards and will last much longer than portable home dehumidifiers. They are highly energy efficient and will operate effectively at lower temperatures, such as may be found in your basement. They are expensive to buy but are generally cheaper over their life-time than a series of portable home dehumidifiers. If you would like to consider this option take a look at our whole house dehumidifier page for a detailed explanation of their superior cost-effectiveness and economy. Most dehumidifiers bought in the USA are for use in basements or crawl spaces. The very good reason for this is that these areas are usually the coolest areas of any home and suffer from the greatest problems with excessive humidity. By tackling a problem in the basement or crawl space you will usually make conditions better throughout the entire house. Because warm air rises your house acts like a smoke stack and draws air upwards from crawl space to attic. If there is humid air in the crawl space or basement that humidity rises with the air. Even worse if there is mold, and millions of dust mites, down below the spores and other "debris" will float up into the home also. For family members who are sensitive to one or both of these well known allergy triggers this can mean serious discomfort or worse. If you need a crawl space dehumidifier I would encourage you to consider a purpose built model. Although they are expensive to buy they are, like a whole house dehumidifier, a more economical long term option. The conditions in many crawl spaces are often too severe for portable home dehumidifiers. 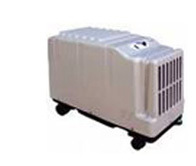 For more information about this type of dehumidifier please visit our crawl space dehumidifier page. 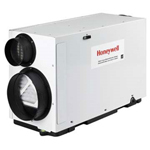 When it comes to basement dehumidifiers the situation is not so clear cut. If the temperature of your basement usually stays above 60-65°F there are a number of portable home dehumidifiers which will be entirely suitable for a basement, provided it is not exceptionally large. For our recommendations go to the best five portable dehumidifiers page. If your basement is cooler than 65°F for significant periods my advice is to consider a basement dehumidifier. Despite its higher ticket price it will save you money in the longer term. The arguments for this point of view are set out in our dehumidifiers for basements article. There are three specific areas for which home dehumidifiers are purchased that deserve a special mention. The first of these is a bedroom where the noise level of the dehumidifier is more important than in any other room of the home. Unfortunately the "whisper quiet" dehumidifier is a product of the salesman's "creativity" and does not exist in the real world. For a fuller explanation of this discouraging truth you might want to take a peek at our quiet dehumidifier article. A second area where dehumidifiers are much used is the bathroom. My main concern here is the mis-selling of mini dehumidifiers for this purpose; they are entirely unsuitable. For our advice about this area of the home please take advantage of our bathroom dehumidifier article. Finally there are areas such as garages and workshops which may be partly or entirely separate from the house and may, in some areas, get very cold inside. Ordinary home dehumidifiers are not suitable for these areas and we explain why, and make some recommendations in our low temperature dehumidifiers article.